No more apple pie ! No more apple crumble ! Our lovely old Bramley apple tree, which must have been at least 50 years old, has succumbed to the gales we had earlier in the week. Extremely high winds affected the whole country, with gusts of up to 140mph in parts of Scotland. It was nothing like that in Lincolnshire, but it was severe enough to be very worrying, and to cause damage. 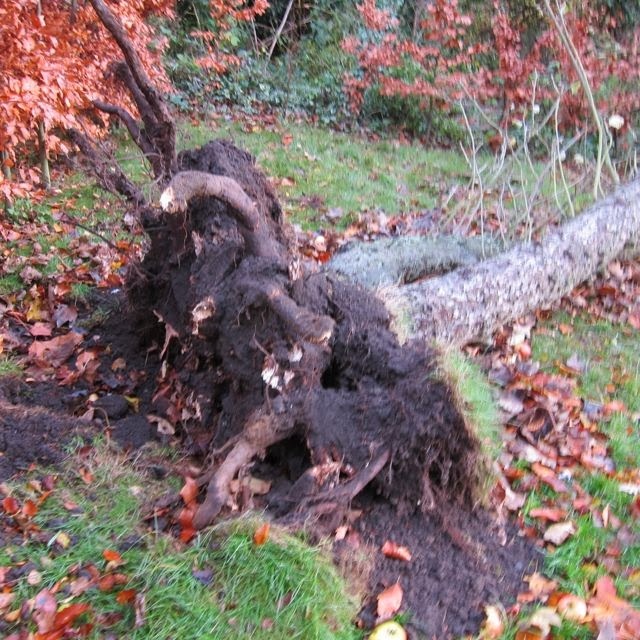 I ventured down the garden the morning after, when the winds had begun to drop, to find our oldest apple tree totally uprooted. Luckily it had fallen clear of the young beech hedge nearby, so had caused no damage to anything. The Bramley apples from that tree made the best pies and crumbles. Although it is sad, in the grand scale of things, it matters not. It is just a tree. The gale force winds were on Thursday, and they were followed by the worst coastal surge for sixty years along the East coast. Hundreds of people in North Lincolnshire and East Yorkshire living along the banks of the River Humber and Trent had to be evacuated, and although no lives were lost, many homes were flooded. Flood defences were breached in several places and the sea came cascading through. Although an Emergency Situation was declared within our region, it was not even deemed to be worthy of mention by the National media. The transport system was in chaos, roads were closed and schools unable to open, yet nothing was reported. One of the main roads into the city of Hull was under water for 12 hours and many shops and businesses were affected. Lots of lives have been affected and people already struggling through a recession have even more hardship to cope with. So, my poor old apple tree doesn't really matter ... only to me. It is all a matter of perspective isn't it ? sad for your tree. I've seen some horrifying images of high seas. Glad you have come thru relatively unscathed. Hmm, makes you realise how little control we actually have over the natural world. The power of the sea is terrifying. We mourn the loss of any tree; it is so sad to see it uprooted like that. You'll miss the apples and you'll miss the blossom. You can plant another one but you have to wait so long for it to give you so much pleasure. Your garden looks wonderful. You are clearly reaping the rewards of 30 years hard work and dedication. Aw thankyou Chloris. Luckily we planted about half a dozen babies three years ago, and they are producing about one apple per season! Still, they are growing! I share your fear - I didn't walk the dogs in the wood that day, in case a tree dropped on our heads ! My husband took them there today and said that lots of trees had actually fallen, so I was glad we stayed away ! 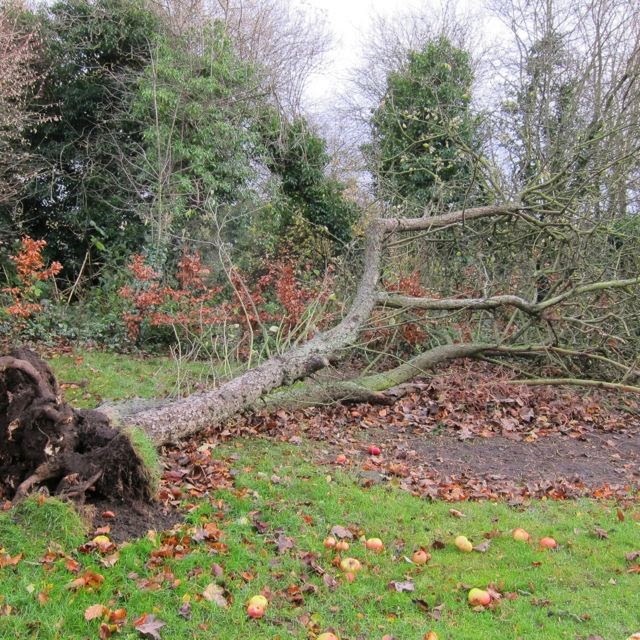 So sad to see your apple tree toppled, but glad the damage was no worse. Hi Rusty Duck, could have been so much worse. My heart goes out to everyone whose house/ livelihood was flooded out. Oh Jane, I feel your pain. It is difficult to grow the lovely old English heritage breeds in Canada. I couldn't believe my luck when I found two Cox's Orange Pippins on our property. They managed about six apples between them, I nurtured them as if they were made of pure gold and then that darn bear came along and ate the lot. Still, they live to produce another day, unlike your poor Bramley. Flooding is horrible. Our in laws had their farm flooded in the Alberta floods in June. They are still waiting for some kind of rehabilatation, finally had heating restored this week. Sometimes people forget how long the recovery period can take. I feel very sorry for all the people affected in the U.K.
Hi Susan, I feel so sorry for everyone affected too, it takes such a long time for things to get back to normal again. A BEAR ate your apples ?? I am zoo impressed ! We get squirrels, mice and the odd pheasant but ... BEARS ! Wow!All I can say is that they have very good taste in apples !! I think it's very sad, and I'm sorry. Losing a grand old tree like that really changes the landscape. It is good that no person was hurt, but I'm still sad about your tree. By the way, my daughter was in Scotland in late October/early November and she loved it! The photos she took while hiking through Scotland are spectacular! I hope that storm will be your last big one for a while. Take care! Hi Plantpostings, we are quite a away from Scotland, but also love to visit as it is a fantastic place ! Hi Stephanie, the plight of people whose houses were flooded put everything into clear perspective for me ! The main road near us has only just reopened due to it being flooded. What a shame about your apple tree! 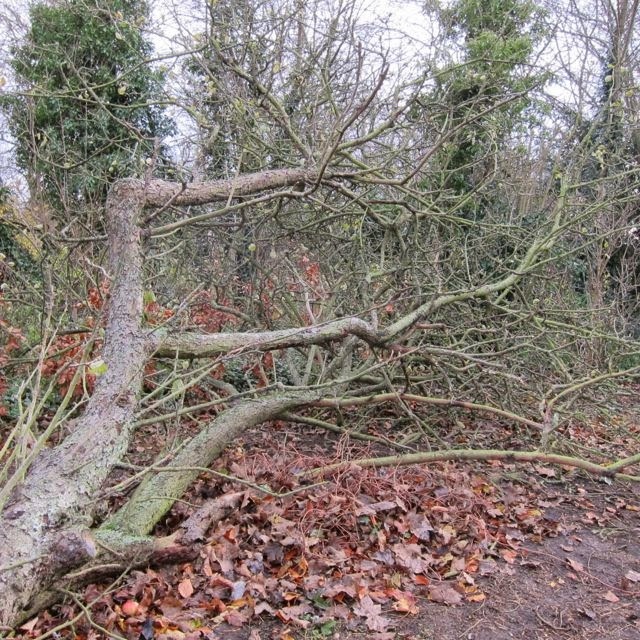 I am glad that the damage was limited to a single tree and did not effect beech hedge or the rest of your garden. I feel for all the people that were effected by flooding especially those people already struggling in these recessionary times. Thanks Jennifer. I have just taken food and cleaning products to the Flood Relief Centre in our nearest affected village, and just driving through is heart breaking. There is damage to many properties and every low-lying dwelling has a skip outside full of ruined furniture and carpets. So many people have lost everything.